Today’s media reports on the first F-35 Lightning fighter jets landing on the deck of the United Kingdom’s new aircraft carrier, making history and marking the beginning of more than half-a-century of ‘Carrier Strike’ operations. 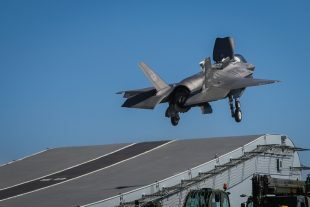 Royal Navy Commander Nathan Gray and RAF Squadron Leader Andy Edgell were the first pilots to land their stealth F-35 Lightning fighter jets on board the carrier, demonstrating the formidable force HMS Queen Elizabeth and her fleet of jets will be. Sky News, ITV, BBC, Telegraph, Daily Mail, Daily Star, Daily Mirror, PA, Forces News all report on the story. “The largest warship in British history is joining forces with the most advanced fighter jets on the planet. This marks a rebirth of our power to strike decisively from the seas anywhere in the world. Pictured: Commander Nathan Gray RN, Makes the first ever F-35B Lightning II jet take off from HMS Queen Elizabeth.